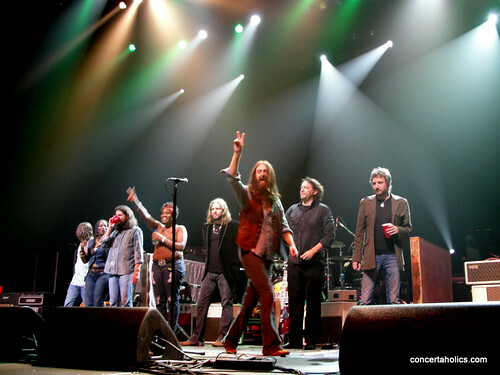 …….I have just been getting into the new BLACK CROWES album BEFORE THE FROST…UNTIL THE FREEZE … right away I notice a lot of pedal steel and some pretty traditional sounding country & country blues stuff… I look over the digital insert and there is this picture of the band sitting / standing outside the entrance to a beautiful log cabin. Man, that said it all it made so much sense the whole sound! Strange how just a single picture can capture the entire “feel” of the album. I got to dig deeper!! …..I am not a huge fan of casino shows for a number of reasons but lately, I am seriously liking, Casino Rama. I don’t want to give away a great secret but there is not a single band that plays this venue that you can’t get to the stage front to enjoy the entire show. I have always had great rock & roll luck and tonight isn’t any different. There are some gems on the new album and we got a lot of them. The set list was somewhat short, only 14 songs half of which were from the new album. With the incense wafting out across the floor, the lights go down & out come a great band, stoned, ready to jam and jam they did!! The show opens with 2 new songs GOOD MORNING CAPTAIN followed by AND THE BAND PLAYED ON. Not my jump out favorites yet but so nice to be hearing these new songs so soon after the release of the album. Get this!! Third tune in – HOTEL ILLNESS – which is just killer!! We are posted stage front right in front of Richs’ stack of Vox amps. The sound here is excellent!! Nothing but pure rock guitar coming through these classic amps! All through the guitar change ups and the effects the sound held perfectly. Forgeting that there was 4800 people behind me I just leaned in against the stage getting sound like the stack was plugged into to my own basement!! The song SOUL SINGIN, from LIONS and then 2 more new tunes back to back, SO MANY TIMES and GARDEN GATE. I enjoyed Garden Gate the most out of these 2. I had been hoping they would play the new tune GREENHORN. This song is an instant classic just way too beautiful!! We get another LIONS tune OZONE MAMA and 3 more new ones I AIN’T HIDING, APPOLOOSA and SHINE ALONG. I have to admit Appaloosa didn’t hit me until I heard it live. What a great song! We got some nice video of Shine Along which is really starting to kick for me as well. I think for the number of times I have been through the new album the number of songs jumping put is quite high. These brothers and this band harmonize nicely!! By the way the new album has 21 tunes on it. What great value!! There is some very “live” sounding material on the new BEFORE THE FROST by “live” I mean it appears it has been recorded as the band played as group in the studio and there is obviously an audience at the end clapping cheering etc… I haven’t got through all the liner notes yet so maybe that will explain. ….8 plus minutes of WISER TIME do I have to say anything more about this one! This is one tune that doesn’t need to be re-invented but they have the last couple of tours and it’s stellar everytime. Close your eyes and groove!! …then we get F***IN’ REMEDY!! What a closer!! All in all a great show!! The entire sound was awesome. Sometimes you have to hand it to sound guys as they can really make a show. The harmonizing I enjoyed this outing better than I did WARPAINT at Massey Hall July 2008. I know you know…. but the Crowes get into these gorgeous jams that just get you swaying with your eyes closed sinking into these plush grooves!!! We scored a drum stick and a set list. My set list read OH SWEET NUTHIN’ which would have been pretty sweet but REMEDY was what got played as the final tune. Just missed a pick! Maybe next time! Here is to the Cabin Fever Winter Tour 2009!! Leave us a comment below if you were at this show or others this tour! Were there any tapers at this show? Get in touch. Love to have the show here. This entry was posted on Saturday, September 12th, 2009 at 3:24 am and is filed under Black Crowes. You can follow any responses to this entry through the RSS 2.0 feed. You can skip to the end and leave a response. Pinging is currently not allowed. Oh yeah…I was at the show, and it absolutely rocked. A number of times I just closed my eyes and was groovin’ in my own little world.I was standing along with a few others in our row, while everyong else around were in some sort of zombie state. The audience for the most part stunk. Rama must be handing out way too many free tix to patrons of the casino that thought they were going to see Counting Crowes or something stupid like that. I love how these guys sounded, and all the harmonies were perfect. I also loved how they didn’t waste anty time telling us “we are the black crowes” or having to introduce individual players. All the time was spent playing some good ole’ funky rock n roll. 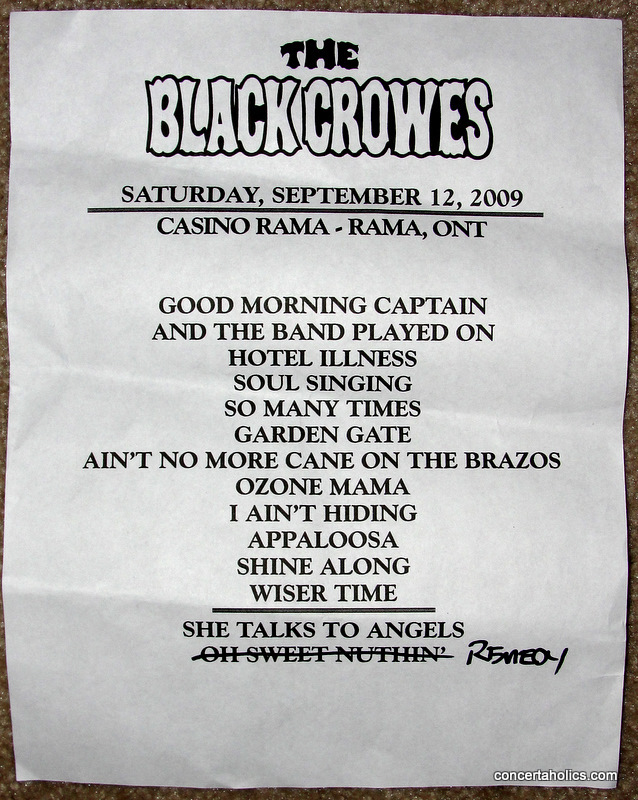 I doubt if I would ever go to Rama again, but next time the Crowes are around I will be there. I enjoyed the show, but was disappointed that most of their song choices were so laid-back. These boys can sure rock when they want to, but The Garden Gate brought me to fits of laughter. They sure do give out lots of free tickets (mine was), and there were a lot of people there who did not appreciate the show. I will say, they sure can play. 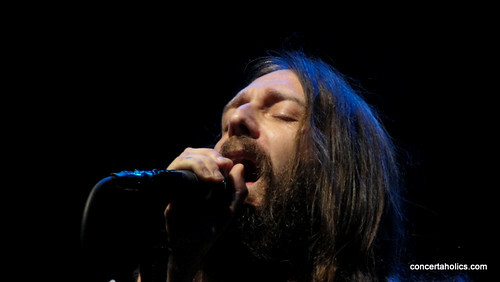 The Crowes always put on an incredible show. Each one is different. 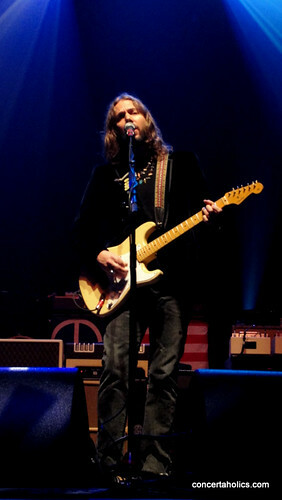 I think Casino shows are strange….they must have a time limit for the band because the Crowes usually play much longer. This show was very much a country-blues show. Excellent but I wish they would have thrown in some heavier tunes. Crowd was definately strange. Guitar player was awesome. They are always one of the best bands to see live and I wouldn’t have missed this show…if you have never seen them…go the next time they are in town! I agree it was a great concert but too short. If I have any beef it was the fact that Chris did not address the crowd whatsoever. No hello How are ya??? Nice to be in Canada again. Nothing. I was disappointed in that. They appeared, played and left. I thought it was rude since these people have bought their albums. But good show nonetheless. Thanks for stopping by Brad, Lisa, Brian & danno.. I agree with you all when an artist says Hello and makes a few comments they connect with the audience for sure. As for hits… I could on with songs I would have loved to hear.. Thorn in My Pride and a slew of others. Heck I wanted to hear Green Horn from the new CD I listed to in the car on the way to the show and it is excellent. 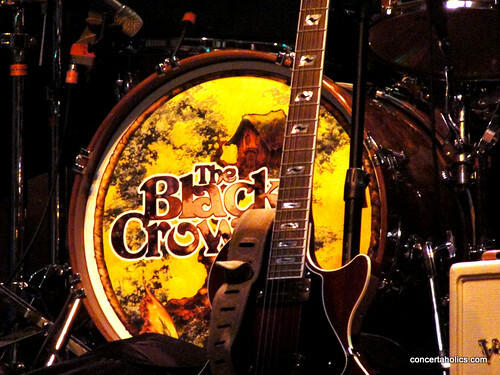 The Crowes are one of those bands who are just musically really easy to listen too. the songs I don’t know sound good right out of the gates… I’m a little less country myself but Chris’s vocals and the entire band just so good. If it’s your first time out to a “casino show” it is far from seeing them in an arena. Smaller setlist always and the crowd is littered with very casual fans. And I also think the Crowes have crossed over a tad to the Jammy-side of live music which for me is ok. I don’t necessarily like it better than hearing 15 radio hits in a row but I like the live experience all the same….but as Lisa says some “Heavier stuff” would have been nice to wake up the gamblers.